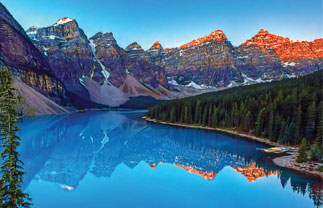 The spectacular peaks and breathtaking scenery of the Canadian Rockies are yours to discover on board the Rocky Mountaineer; ‘The Most Spectacular Train Trip in the World’®. Each Rocky Mountaineer rail vacation is a journey through a landscape whose scale and grandeur never fail to leave a lasting impression on those who experience it. The first-class service on board is complemented with an overnight stay in comfortable accommodation midway through the tour to give you a closer look at the spectacular surroundings. The custom-designed, bi-level, glass-domed GoldLeaf coach puts you right in the middle of the awe-inspiring scenery of the Canadian Rockies. Take in the dazzling vistas upstairs, and enjoy delicious meals downstairs. From the attentive service provided by your Rocky Mountaineer Hosts, to the gourmet meals prepared from regional cuisine by our award-winning chefs. GoldLeaf Service is quite simply, as good as it gets. Discover SilverLeaf service, a new way to experience Rocky Mountaineer’s rail journeys into the Canadian Rockies. Take in the awe-inspiring scenery through the panoramic windows of our custom-designed single-level dome coach. 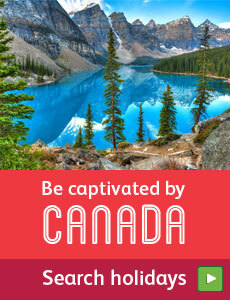 Journey through the spectacular peaks and breathtaking scenery of the Canadian Rockies on board the Rocky Mountaineer. Your stop at Jasper allows you to get up close and personal with some of Canada's local wildlife, while your time in Lake Louise will be spent exploring the breathtaking Peyto Lakes and Crowfoot Glacier. Make the journey of a lifetime with this Western tour.